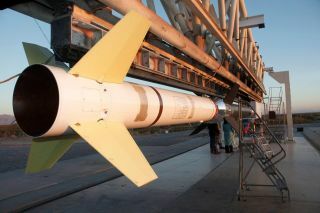 The sounding rocket carrying the first flight of FOXSI, an instrument gathering X-ray data about the sun, before its launch in 2012. A small NASA sounding rocket carrying a parachute for Mars landings will launch a test flight on Sept. 7, 2018 from the agency's Wallops Flight Facility on Wallops Island, Virginia. Editor's note: This story has been corrected to clarify how sounding rockets fly.